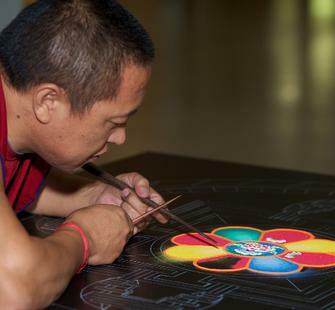 A group of five Tibetan Buddhist monks from the Drepung Loseling Phukhang Monastery will build a piece of traditional Tibetan Buddhist artwork, the Sand Mandala, also known as a Sand Painting, in the Project Space Gallery at Montalvo. 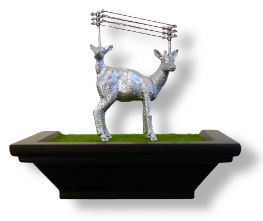 This project can be appreciated simply as a piece of "time-based art." According to Tibetan Buddhist belief, the creation of a Sand Mandala is meant to create a profound experience of compassion. The positive effects of a Sand Mandala are believed to radiate out over an entire region, blessing the environment and the beings therein, as an effort for world peace. Once created, the Sand Mandala is destroyed in the Closing Ceremony, as a lesson in the impermanence of all life. An Opening Ceremony for the event took place on December 12 at 1pm. 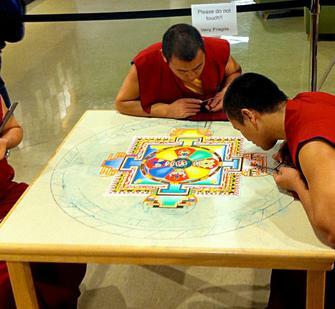 The monks will work on their Mandala for five days, and will destroy it during the Closing Ceremony at 6pm on Thursday, December 16. The gallery will be open for the public to observe the monks throughout the process of creating their work. Both ceremonies, as well as a live feed of the monks working on the Mandala, will be streamed live online at our UStream channel - so if you can't be here, be sure to tune in throughout the day!